Parakeets, originally from Australia, are a popular pet kept in homes around the world. Normally, they maintain a healthy beak by eating a diet of seeds and fruit, grooming, climbing, chewing on toys or rubbing their beak against an abrasive surface. Sometimes, however, a parakeet's upper or lower beak may become overgrown and require that you trim its beak using a file or Dremel tool. Consult a bird book or ask an employee at a pet store to determine what the normal length and shape of a parakeet’s beak is. Fasten the light-sanding attachment to your Dremel tool. It's the best tool for trimming your parakeet’s beak because of its gentler structure. It also prevents harm toward your pet. Take the parakeet out of his cage or perch. 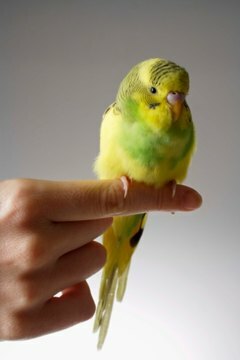 Ask an assistant to help you restrain the parakeet’s body, wings, feet and head by using a soft bath towel to wrap him so your hands are free to do the trimming. Hold the beak closed with one hand by placing your palm over his head and securing his beak with your fingers, while applying the Dremmel tool to the point of the Parakeet’s beak. Hold the beak steadily to avoid any injuries, as the Parakeet might squirm or try to bite. Make sure to wear protective eye wear while doing this. Start trimming the beak. Shape and reduce its length and smooth those damaged and rough areas. Do not inhale the dust caused by filing the beak. Clean the grinding tools after you have finished the trimming process.